‘Toy Story 4’ is one of the most-anticipated movies of the summer, but PETA isn’t too thrilled with the way Bo Peep is being portrayed. LOS ANGELES — We were given a new glimpse at Toy Story 4 when Disney aired a fresh trailer after the New England Patriots won Super Bowl LIII. 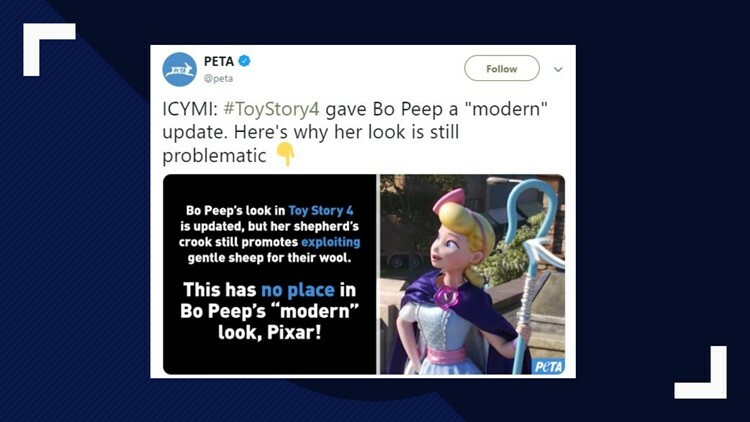 While fans were buzzing about seeing the return of Bo Peep, PETA (People for the Ethical Treatment of Animals) wasn’t too impressed with her "problematic" appearance. Bo Peep will return to the Toy Story franchise with a “modern” new look for its final film, and PETA is calling on director Josh Cooley to complete the character’s transformation by retiring her crook—a tool historically used to hook lambs by the legs and neck in the wool industry, much as the bullhook (now widely banned) is used to jab and pull elephants in the circus.